For a trendy departure from traditional dinnerware, serve your menu items on this stunning Acopa 10" square bright white porcelain plate! This plate combines simplicity and style to add elegance to your tabletop. Its chic, 10" square design is great for serving main entrees and shared platters, while the crisp, bright white color enhances any style or color of table linens, dinnerware accessories, or table settings. I got these and they make a great set, I wish they were slightly larger as I was hoping to replace my larger plates with them but we have gotten used to using these with the squares. Acopa is my new favorite brand on Westaurant store, we switched to these white porcelain dishes last year and got nothing but compliments. great price too. Be warned these plates are deceiving, the 10 inch are way too big compared to the round we were using, we switched to the 7 inch. These are large plates with ample room for generous portions. They arrive packaged very well with protective material between each plate. They are glossy and bright white which makes for an attractive meal. Good product, great price. Plates are heavy, be aware. Some imperfections on the surfaces as well, but to be expected at this price. I will be buying more. These plates are fabulous. They hold a lot of food and are very easy to clean. The customers love how elegant our plates look. I highly recommend. I use these for my main food at my restaurant and it's the perfect size for a burger and some fries. It's not so tiny that the food overpowers it but it also isn't so big that it makes my portions look small. These are Perfect for dinner entrees. Enough room for an entree and a side. It makes the plate look so full and they are very durable. 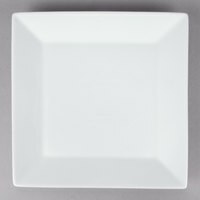 A very nice bright white colored porcelain plate from Acopa dinnerware. The 10" plate is terrific for serving our grilled burgers and toasted grilled cheese sandwiches. Such a heavy plate with a nice size rim, really features the food and nothing compares to white background for food. We havent had them long enough for any to break, but we expect it eventually. So far, no nicks or scratches or chips! Love! These plates are very clean and simple yet elegant. They work for breakfast, lunch and dinner selections. The shape allows for multiple plating options. These are very glossy which makes cleaning easy... Only a 4 star because food slips right off the plate if the server is turning or moving to quickly. Absolutely amazed at the difference these plates make for the food presentation. These are an absolute must buy for any style restaurant. I highly recommend these plates! I love any product that the Acopa company makes. I know that I will be getting a good high quality product every time. Thank you! A bright white plate that is made of strong, durable porcelain and is very resistant to chipping. The 10" is perfect for lunch portions and stack great. We ordered these for use as our everyday and company dinnerware at home. They make everything I serve look exceptionally beautiful, against the bright white background. The plates are heavy and seem much more expensive than they actually were. The square shape is more modern and 'foodie friendly' than the round plates that I previously used and gave away. Even our everyday meals seem fancier, because I'm serving them on restaurant style dinnerware. I'm looking forward to using these dishes at parties and family gatherings like Thanksgiving, because they kick it up a notch, for sure. These plates are perfect for what we need for our clients, and at a great price point! They have held up to many uses by our clients. Thank you! These are very nice, bright white plates. We haven't had any issues with chipping or breakage. They are a little on the heavy side though, so our servers cannot take too many at once. These acopa white plates are a great quality and great buy. The white is bright and the plates are very heavy. The 10 inch is perfect for dessert. These are beautiful plates. They have a nice glossy finish and are a true, crisp white. They are very heavy which I love. A great buy! I purchased these plates for my home. They are beautiful and very sturdy. Good size and great price for the plates. I will purchase more. These plates are amazing!! I'm loving using them! They are exactly what I needed. Great for outdoor use! I am very happy with them and plan on reordering them. Very sturdy and good weight dishes. Price was great and durability has been great so far. Presentation looks great at the table on these plates as well. Very elegant looking plates that bring out the colors in food. Heavy and does not chip easily. Can go with either casual or semi high end dining. These plates are great all purpose plates that can hold a lot of food. They are heavy weight and have nice thick rims with plenty of space. Highly recommended! These are really nice and I like them. I purchased them for daily use, and I think one of the most important things for dishes for daily use, especially if you have kids, is that we will break dishes eventually, but we can buy the same plates again whenever we need. These plates are PERFECT for parties! I plan on ordering another 12. They coordinate so well with white accessories, as well as when adding a splash of color for the seasons. Very happy with the quality and durability. Perfect find and purchase! Great Plate! But chips on the corners if not stacked in the dish area properly, we have chipped a few already and broken some as well. More fragile than other plates in our restaurant. They plates are a great value. We use them for catering. They are the perfect size. They can take a beating and never chip. They are heavy, great quality and are the best alternative for not having to rent plates for events. These plates look great in our casual brewpub. Some of them came with slight black dots or smudges but it was only a few and very tiny. I actually dropped one of these on the concrete patio and it bounced, and didn't break. We have been shopping for simple , sleek white plates, and when we found these, we were delighted! The price point was fully a third of other similar plates. For our money, they are perfection! We utilize these plates for everyday wear in our fast paced environment. They are perfect for small desserts or bread and butter plates. They don't chip and hold up well. Our chefs are very happy to use this roomy plates. They make looks great our sushi and can use for many things. We will by them again. We purchased these for home use. We use them daily, special occasions & when hosting dinners. They nice and extremely durable. My husband dropped one and it marred our hardwood floor that is how durable they are! Well worth the money. we bought these for our main dish plates. with the other sizes we bought the set looks complete and sleek. they are roomy enough for a full main dish even when we serve a duet with three side dishes. Purchased for home use. Nice size, weight and quality. Very durable. No chips and they have even survived a drop onto granite counter-top. Great purchase.